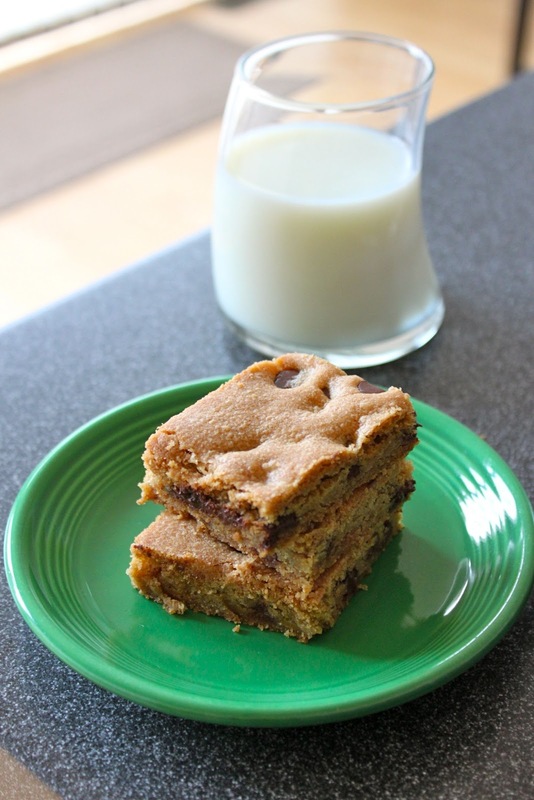 These bars are really easy to make and incredibly delicious as I mentioned above. Sometimes you need or want to bake something and just don't have time for the fuss or muss. Well, these are your cookies. They taste great too, so it is a win win. I made these in a half sheet pan, 11x17, and think it would be fun to make as a birthday cookie cake. I also think a fun alternative to slicing squares would be to use cute cookie cutters since the bars soft and quite easy to slice. I used a Martha Stewart recipe and it is a good thing I read the comments first. I baked these for 20 minutes and you can see they came out perfectly. The original recipe said to bake them for 40-45 minutes and they would have been completely burnt. Please keep that in mind when you try them. Preheat oven to 350 degrees Fahrenheit, with rack in center. Generously butter a 11x17 rimmed baking sheet; set aside. In a medium bowl, whisk together flour, baking soda, and salt; set aside. Spread dough on prepared baking sheet. Bake, rotating sheet halfway through, until edges are brown and top is golden, 20 - 25 minutes. Transfer to a wire rack; cool completely on baking sheet before cutting. Would love to have one with a glass of milk for a treat this evening. They look easy to put together! I'm going to make this for the family :) Thanks! I love cookie bars! The same great taste of a cookie without the hassle of scooping the dough and carefully monitoring the oven with each batch. 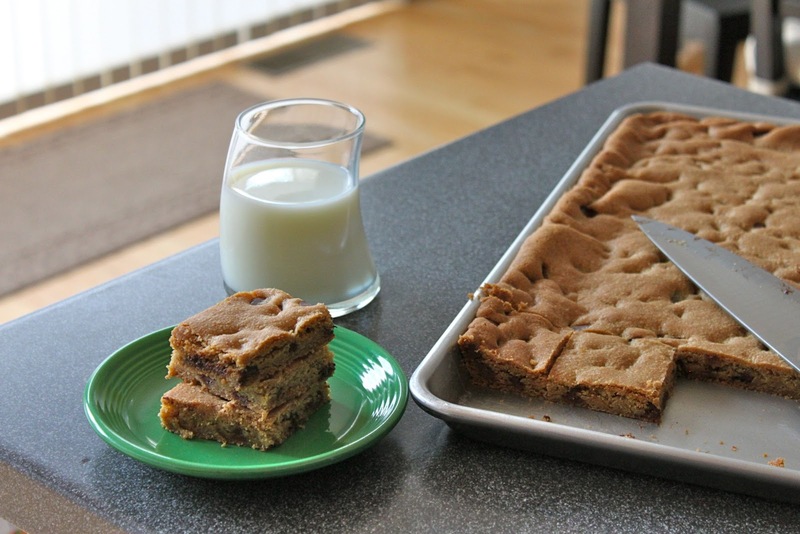 Cookie bars are one of the staple baking recipes in my kitchen. I'm always looking for new recipes. Used to live in DC, more NOVA... but hung out in Adams' Morgan and Georgetown. They are a little gooey inside, how wonderful!